Yesterday was a cool, dark and slightly stormy day here in North Texas. Well when I say “cool” that’s a relative term, it was probably around 80 degrees. But that’s cool for Texas in Mid-June. Needless to say the rain left me craving a warm comforting bowl of soup, and I had one bowl soup on my mind. Cheesy Chicken Enchilada Soup. This is a soup that I started making right after I was married 10 years ago and it is a family favorite. I always take this Cheesy Chicken Enchilada Soup to a big family reunion called “Fall Round-Up” every year at the end of October. The Mexican spices in this soup will warm you up on a cool fall day with a flavor that tastes just like my Mom’s Chicken Enchilada Casserole. What I love about this Cheesy Chicken Enchilada Soup is its super easy to make and cooks in no time. My little secrete ingredient in this soup is I get a little help from the grocery store by purchasing one of their AMAZING smoked rotisserie chickens. The smoky flavor from the chicken combined with all of the chili spices, in this creamy, cheesy soup are TO DIE FOR. Cheesy Chicken Enchilada Soup is even a favorite of some of the pickiest eaters I know. 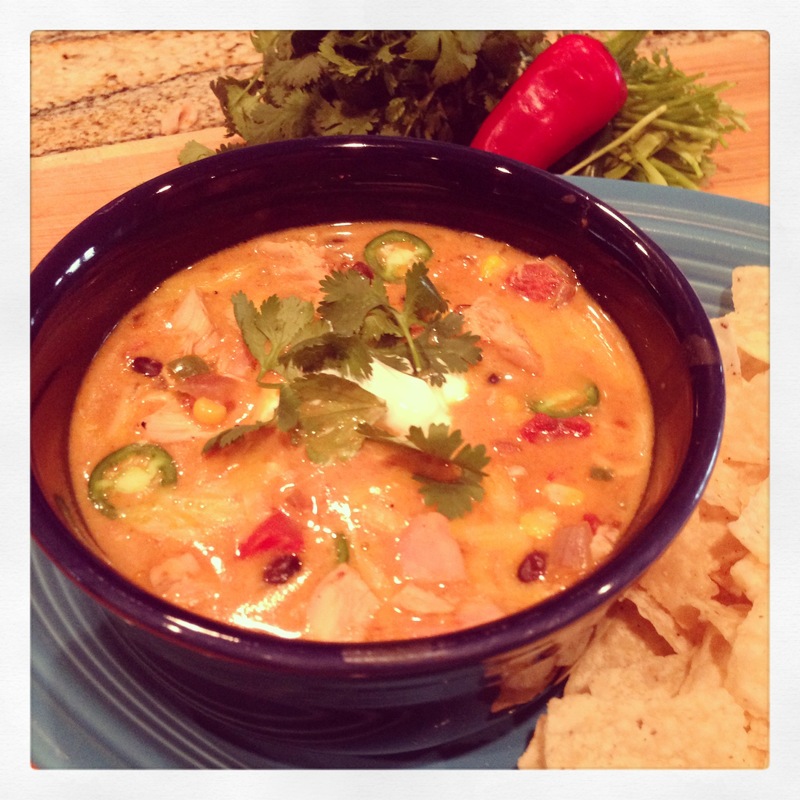 It’s a winner, winner, Cheesy Chicken Enchilada Soup, Dinner! Everyone has been asking me for this recipe for years so here it is. Prep all of the vegetables and measure out all the spices. In a large pot, heat up the 3 tablespoons of Extra Virgin Olive Oil over medium heat. Then sauté the, onion, jalapeño, corn, and garlic with a good pinch of salt and a few cracks of black pepper. Cook until tender, about 5 minutes. Once the vegetables are tender, stir in the spice mix and cook for 1 minute until all the spices are fragrant. Add in the can of cream of chicken soup, 6 cups of chicken stock, the drained can of Rotel, and the drained and rinsed black beans. Give everything a good stir to combine. Bring up to a boil then reduce to a simmer for 15 minutes. Meanwhile shred up the chicken into small bite sized pieces, and cut the Velveeta into small chunks. Then add the chicken and the Velveeta cheese into the soup. Give everything a good stir every couple of minutes until the cheese has completely melted. In a small bowl add the 2 teaspoons of instant masa and the ¼ cup of chicken stock. Stir the slurry with a fork until its smooth then stir into the soup. Simmer the soup for another 15 minutes. Serve big bowls garnished with some grated cheddar cheese, sour cream, thinly sliced jalapeño, cilantro and corn tortilla chips on the side. ** Tip — For an easy way to get the fresh corn off the cob use a bunt pan. Stand the end of the corncob on the hole of the bunt pan. As you cut the corn kernels off the cob they will fall in to the well of the pan.